Enjoy this workshop where you will be presented with a whole fish and learn the process of cutting it so that it can be eaten as sashimi. At the end of class you will eat what we have prepared. All fish that you will be using are high-quality and very fresh. Once you come to the designated venue, you can get ready for an authentic and professional experience. First you will learn how to cut and recognize a high-quality fish. Then, you will cut various different types of fish, depending on the season. 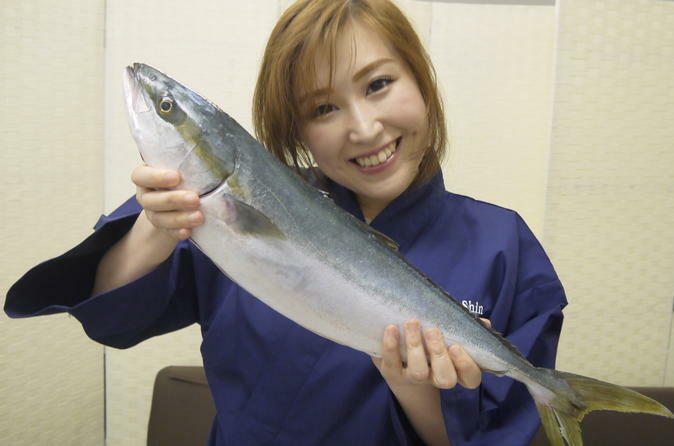 You will cut for example two Aji (horse mackerel), one medium-sized seasonal fish (Isaki, Yellowtail, Tai etc.). Your first fish will be guided by the instructor, after that the instructor will watch as you try to remember and recreate the steps. If you don't remember don't worry you will get help. After that you will cut the larger fish using many of the same techniques. Once you cut your fish, following your instructor´s guidance, you can take it home and eat as sashimi. The portions are larger than what you would normally get at a sushi restaurant.